Members of the Fact-Finding Mission on Israeli Settlementsfrom left: Unity Dow, Christine Chanet, Chairperson and Asma Jahangir hold press conference. An independent inquiry mandated by the United Nations has called on Israel to halt all settlement activity and to ensure accountability for the violations of the human rights of the Palestinians resulting from the settlements. The report of the International Fact-Finding Mission on Israeli Settlements in the Occupied Palestinian Territory (OPT) states that a multitude of the human rights of the Palestinians are violated in various forms and ways due to the existence of the settlements. “These violations are all interrelated, forming part of an overall pattern of breaches that are characterized principally by the denial of the right to self-determination and systemic discrimination against the Palestinian people which occur on a daily basis,” said a news release on the report. Since 1967, the Mission’s report notes, Israeli governments have openly led, directly participated in, and had full control of the planning, construction, development, consolidation and encouragement of settlements. “In compliance with Article 49 of the Fourth Geneva Convention, Israel must cease all settlement activities without preconditions,” said Christine Chanet, chair of the three-member inquiry. Israel must “immediately initiate a process of withdrawal of all settlers from the OPT,” the Mission adds, as well as ensure “adequate, effective and prompt remedy” to all Palestinian victims for the harm suffered as a consequence of human rights violations resulting from the settlements. 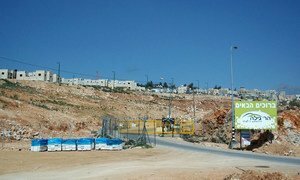 The report states that settlements are established and developed for the exclusive benefit of Israeli Jews. They are maintained and advanced through a system of total segregation between the settlers and the rest of the population living in the OPT. This system of segregation is supported and facilitated by strict military and law enforcement control to the detriment of the rights of the Palestinian population, it adds. “We are today calling on the Government of Israel to ensure full accountability for all violations, put an end to the policy of impunity and to ensure justice for all victims,” said Asma Jahangir, another member of the Mission. The report states that Israel is committing serious breaches of its obligations under the right to self-determination and under humanitarian law. “The magnitude of violations relating to Israel’s policies of dispossessions, evictions, demolitions and displacements from land shows the widespread nature of these breaches of human rights. The motivation behind violence and intimidation against the Palestinians and their properties is to drive the local populations away from their lands, allowing the settlements to expand,” said another member, Unity Dow. The report, which will be formally presented to the Council on 18 March, states that private entities have also enabled, facilitated and profited from the construction of the settlements – both directly and indirectly. Secretary-General Ban Ki-moon has taken note of the report, according to his spokesperson, who said Mr. Ban has repeatedly made his views on Israeli settlements clear. “All settlement activity in the occupied Palestinian territory, including East Jerusalem, is illegal under international law,” the spokesperson said in a note issued to the press. United Nations Secretary-General Ban Ki-moon again called on Israel today to withdraw new settlement plans for East Jerusalem while stressing that protests over the plans, as well as reactions to them, must remain peaceful, noting that they had been largely non-violent so far.